So, American Cyc was having a garage sale or something, where they were digging all the crap out of the basement and making deals. Sounded fishy to me just cause American is such a boutique to begin with. Friday night was a "preview", Saturday and Sunday the sale. Hanzo had to head up to Upper Hate anyways and he needed a seat for Moni's new ride (pics of that to come) so he stopped by to check it out on Friday. Turns out they were selling stuff Friday. 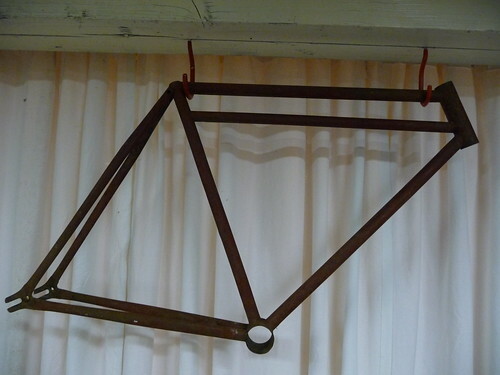 I get a text from him talking about some crazy rusty double top tube frame for $20. I text back GET IT. He does. It's my size, AND I had recently donated some tasty parts to Moni's build, and some tool/tech help so he kicks down. He's of the mind that it could be restored to rideablility. I'm not so sure, many variable$. 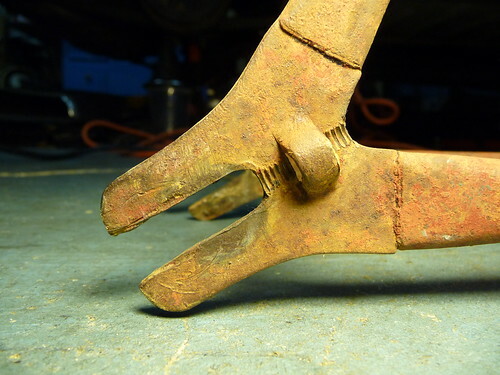 A: Leave it completely alone with it's rusty patina and let it hang down in the lab as Art. 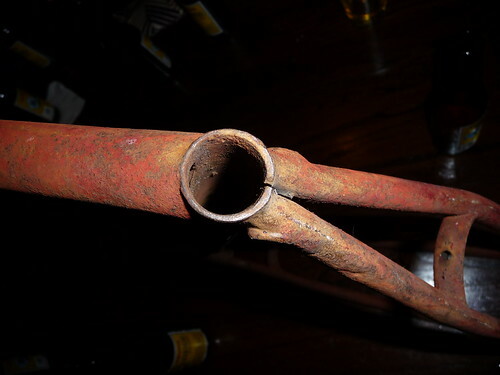 B: Take a Brillo to it and see if it is only surface rust. 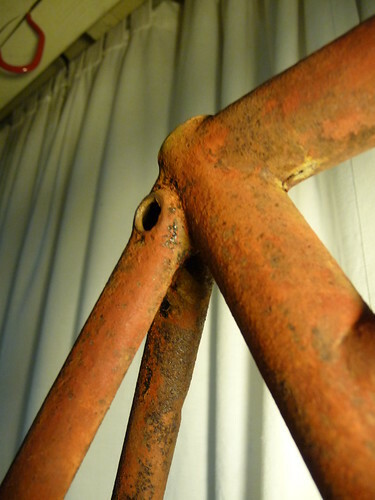 If it is surface see #3, if its not, the even patina is ruined but could be cool as a super cleaned pitted look. 3: Take it to a powdercoater to have it sandblasted and add color. 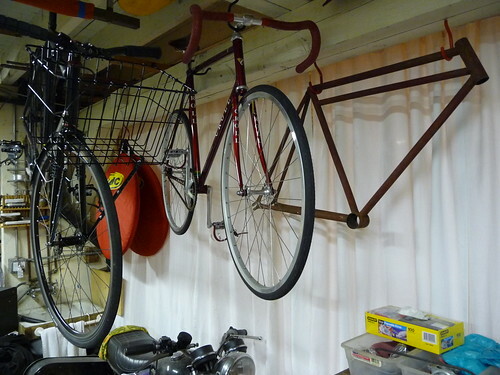 D: Build it up with vintage rusty track parts and let it hang down in the lab as Art. 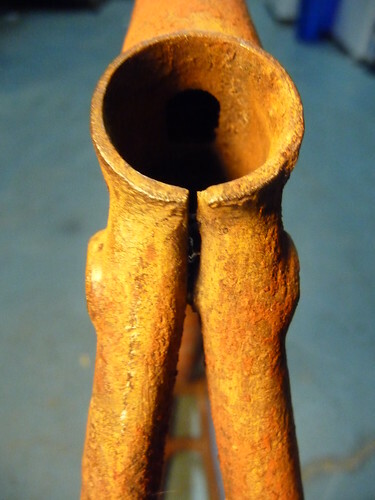 The seat tube is tiny, seat post will be weird. 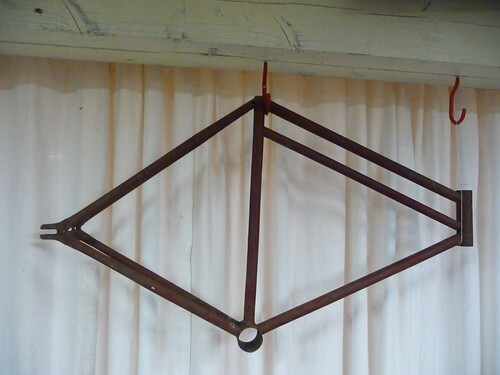 The bottom bracket is threadless so some kinda of pounded bottom bracket and then the matching cranks. And who knows what size the headset is, and as for a fork... I haven't put a rear wheel to it yet, but look at the angle of those rear dropouts. 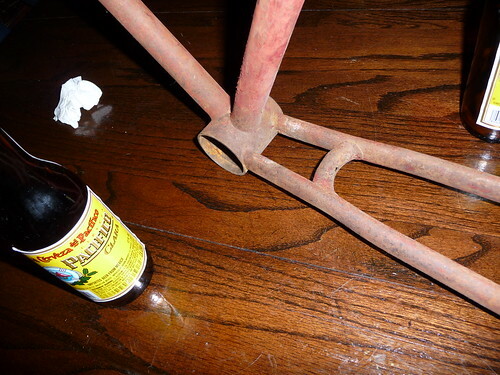 Look at those rear dropouts, look at those headtube/seat angles, could it be that this is some old "crazy bike". 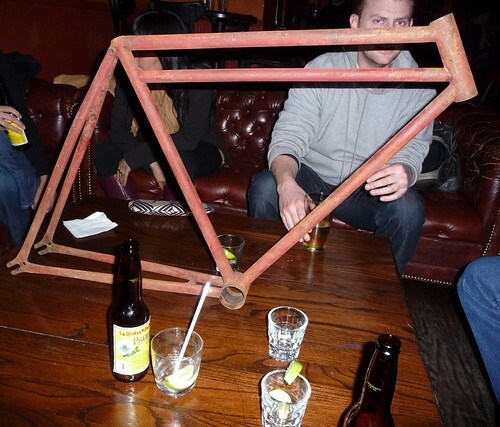 Some kind of Double Top Tube TT bike or something. What do you think about that? So anyways, I'm putting a poll on the blog. Please vote and/or comment at the end. I want some input, some opinions, some facts. Please email this to your cyclofriends and we'll see how the poll goes. Thanks, I owe you a beer. 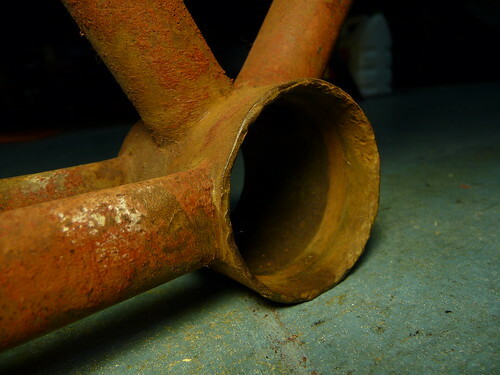 Also, that bottom bracket. NOT happening. Leave it outside for the winter and then hang it up. It's pretty.